I will be turning in my blk 2004 PT this Friday. 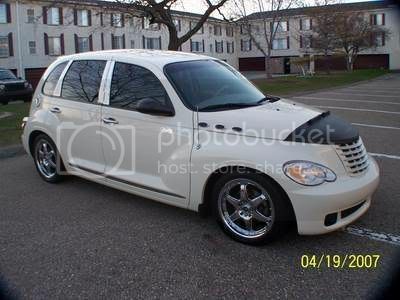 I will be getting a new 2006 Cool Vanilla PT. It too is a base model. I will be putting my wheels, stereo, remote starter, and lowering springs on it. It is still gonna be my second car. I could not pass up this deal. No money down and $167.00 a month. This is with an employee discount and a $500 coupon from Chrysler. This is the color my girlfriend likes. I like it too. I do like the new interior. It seems more upmarket. I like the stand alone clock. I can't wait. BTW, I will be giving my grill and headlight covers to my dad for his PT. Congrats and enjoy. I got the Chrysler magazine, and I like the look of the '06 - particularly the front and rear bumpers - seem smoother. I don't like the handle - too squared off - I'd change it out for one that's curved. That'd be first mod.